Professional Dog Walker - Fully Insured - Dog Day Care and Overnight stays in Ivybridge, Devon. Dogs R Us UK provide a Dog walking, Dog boarding and Dog day care service for both large and small dogs in Ivybridge, Devon covering areas; Ivybridge, South Brent, Wrangaton, Cornwood, Bittaford, Ermington and Lee Mill. We also cater for dog owners going on holiday. We offer home from home care with no kennels, offering your dogs the love and care they deserve. 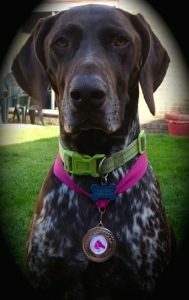 Hi I am Jazz, a German Shorthaired Pointer, pointing you in the right direction for a professional dog walking service! I am one very lucky dog! Usually I go for long walks through the open fields and also accompany my owner when she rides her horse which is great fun. I think I love the horse as much as she does. Ever since she started Dogs R Us UK my life changed for the better. Not only do I still go on lovely walks and swim but I get to play with other dogs on a daily basis. It is so much nicer than being left on your own. There are a couple of dogs that are my best buddies and we love to wrestle and chase each other but I actually get on well with them all, large or small! Look forward to walking and playing with you! Provide a fully insured dog walking, dog boarding and dog day care service. Professional dog boarding service in Ivybridge, Devon.